86 years, 11 months, 21 days old age. 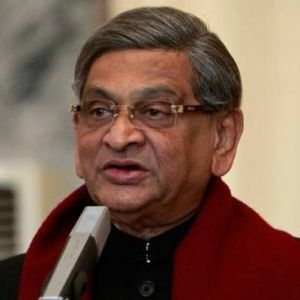 S. M. Krishna will turn 87 on 01 May, 2019. Only 9 days, 10 hours, 15 minutes has left for his next birthday. S. M. Krishna has celebrated the total number of 86 birthdays till date. See the analysis by days count and bar graph. S. M. Krishna was born on 01-05-1932 in Mandya in the state of Karnataka, India. He is an Indian Politician, Chief Minister & Governor. He is one of the vastly educated Chief Ministers Karnataka has ever had. A graduate of Maharaja’s College, Mysore, he later obtained a law degree from the Government Law College, Bangalore. He studied at Southern Methodist University, Dallas, U.S.A. and later at George Washington University Law School to be a Scholar in his field. Back in India, he worked as a Professor of International Law in Renukacharya Law College, Bangalore. This Tennis Lover has held several positions in his political career. From 1962 to 1967, he was the Member of 3rd Karnataka Legislative Assembly, Member of Indian Parliamentary Delegation to Commonwealth and the member of Parliamentary Conference in New Zealand. From 1971 to 1982, he was the member of the 5th and 7th Lok Sabha, the member of Karnataka Legislative Council and the Minister for Commerce & Industries & Parliamentary Affairs, Government of Karnataka. In 1999 he became the Chief Minister of Karnataka till 2004. He also handled the Post of Governor of Maharashtra from 2004 to 2008 preceded by Mohammad Fazil and Succeeded by S.C. Jamir. On 22 May 2009, S.M. Krishna took the oath of office as a Union Cabinet Minister of External Affairs in the Council of Ministers under the Prime Minister Manmohan Singh. As per the source, he has resigned and sent a letter to Congress President Sonia Gandhi informing her about his decision. Krishna was married on April 29, 1964, and having 2 daughters and his Son in law are businessmen.